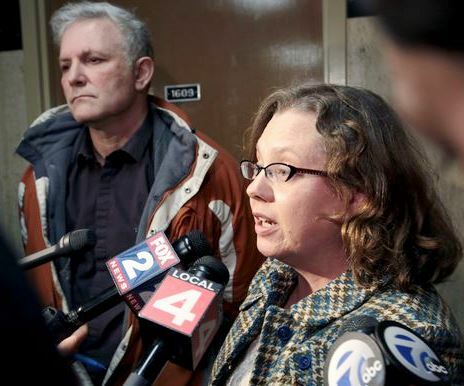 Steve Conn and Nicole Conaway, two leaders of massive teacher sick-outs of January, on trial at Cadillac Place July 8; protest called for 9 a.m.
DETROIT – First they came for the City of Detroit, the largest Black-majority city in the U.S., stealing its major assets including the $6 billion Detroit Water and Sewerage Department under a contrived bankruptcy deal. Now the same actors have come for what is left of the Detroit Public Schools (DPS) district and the future of the city’s children, 59 percent of whom live under the poverty level. On June 21, Michigan Gov. Rick Snyder signed Public Acts 192-197, which kill the publicly-run DPS district, founded in 1842, and replace it with a state and corporate-run “community district” including charter schools. Snyder and DPS Emergency Manager Steven Rhodes, the judge who confirmed the City of Detroit bankruptcy plan, claim they will establish an a new allegedly “debt-free” community district, leaving DPS to pay-off nearly $3 billion in outstanding long-term debt, due through the year 2040. They are being advised by many of those who engineered the phony Detroit bankruptcy, including Gustav Mulhatra of Ernst & Young and Alex Koch of AlixPartners. Koch (no discernable relation to the Koch brothers) emailed Snyder on April 28, 2016 that the new debt-free district is a myth. He proposed that the state should create a 10 year irrevocable trust to administer payment of the legacy debt. Mass protest at beginning of Detroit bankruptcy eligibility trial Oct. 23, 2012. His proposal is reminiscent of the Detroit bankruptcy disposition of the city’s multi-billion dollar art collection into a so-called “charitable trust,” taking possession of it away from the people of Detroit. The Detroit City Council voted to approve that action. Rhodes has also ordered the DPS to borrow as much as $235 million initially in new “school financing stability bonds,” to restructure its outstanding debt, in addition to $150 million as “transition money” for the new district. “Stability bonds” are not limited by state law to 15 percent of the assessed value of all taxable property in the district. They will eventually greatly increase the “community district” debt load after 10 years and lead to more taxes on Detroit residents, who will have no say in the administration of the new district. Detroiters are already losing their homes by the tens of thousands due to tax foreclosures. Teachers Steve Conn and Nicole Conaway are calling for protest outside Cadillac place Friday, July 8, 9 a.m. Similarly, the City of Detroit’s debt load skyrocketed 300 percent after the bankruptcy confirmation, in order to pay off corporate creditors in new bond issues. Part of its debt, the 2005-06 $1.5 billion Pension Obligation Certificates loan from UBS and partners, also recalls Snyder’s plans to borrow money not regulated by the state. Other parts of the Acts allow the new “community district” to hire uncertified teachers, and eliminate seniority as a consideration in promotions and other matters. The bills define major penalties for school workers who strike and stage “sick-outs,” as they did en masse in January. On Friday, July 8, a trial begins for two leaders of the days-long teacher “sick-outs” of last January, after all other defendants including the Detroit Federation of Teachers were dismissed from the case by Court of Claims Judge Cynthia Stephens. 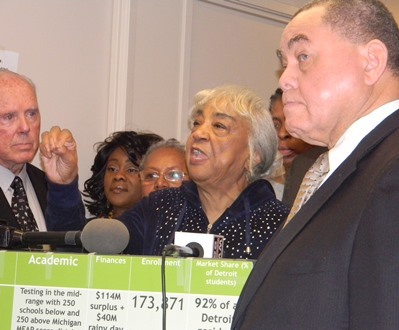 Some leaders of the DFT joined in supporting a Senate version of the DPS Acts that did not include the anti-union clauses, but still dissolved the Detroit Public Schools. Judge Michael Talbot, Michigan Gov. 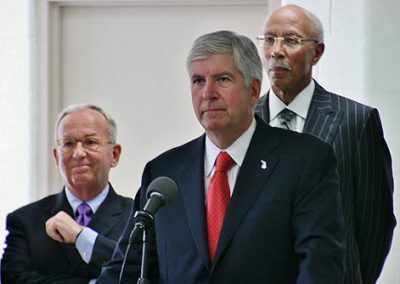 Rick Snyder, and former Detroit Mayor Dave Bing at opening of Detroit Detention Center in old Mound Road prison in 2012. Former DPS President Steven Conn, a long-time math teacher and respected militant, and Nicole Conaway, who taught at the Catherine Ferguson Academy and fought along with its students to keep it open, remain as defendants. They are asking supporters of Detroit teachers and residents’ rights to retain the Detroit Public Schools to rally outside the building at 9 a.m. as they face trial. “Coming at such a critical moment in the struggle around education in Detroit, this trial gives Detroit teachers the chance to begin to turn the tables on Snyder and Rhodes, despite the governor’s recent legislative success,” Conn said. See full release at http://voiceofdetroit.net/wp-content/uploads/DPS-teachers-Trial-for-Conn-and-Conaway-10-am-Friday-July-8.pdf. Long-time schools advocate Helen Moore speaks at earlier press conference when board filed a class action lawsuit on behalf of DPS children. Atty. Thomas Bleakley is at left; then Board Pres. Herman Davis at right. Also in the Court of Claims are DPS parents and Detroit Board of Education members, who filed suit July 5 for an injunction to stop the death of DPS. Their case, Moore v. Snyder, is being heard by Chief Judge Michael Talbot. He said no such two-thirds majority was achieved, and added that the Acts violate both state and federal constitutions. Detroit uses non-certified “Teach for America” educators in its charter schools, which perform worse than DPS schools. Most of the TFA teachers shown in this awards photo are white, out of proportion to DPS’ racial composition. “The rights of equal protection and due process of all children of the DPS district, irrespective of race and ethnicity, have been violated by the new laws that allow uncertified teachers to be hired in the district while the other 548 public school districts must still use certified teachers,” Bleakley declared. DPS EM former Judge Steven Rhodes. The board demanded in addition that Rhodes provide a forensic audit to back up his claims that the district was in deficit and therefore needed severe solutions. According to the most recent Comprehensive Annual Financial Statements for DPS, for 2014-15, the board ended that year with a $216 million deficit. 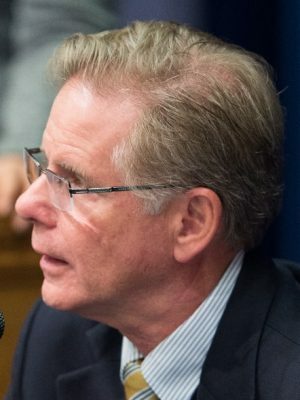 Wallace Turbeville of DEMOS earlier reported that the City of Detroit’s only problem was a $167 million deficit which could easily have been resolved by various measures including state restoration of revenue-sharing funds to its cities, which have lost over $700 million in the last 10 years. President Lamar Lemmons moved to have the Board ask the federal government for an investigation regarding the misappropriation of federal funds under Emergency Managers. The bills leading to Acts 192 to 197 were hotly debated in the state legislature, particularly by Detroit Senators and Representatives who said they were not involved in drafting legislation for their own district. 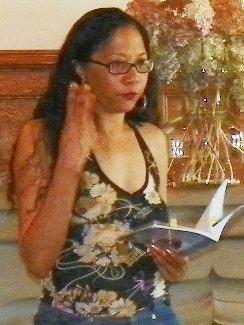 Aurora Harris, parent of DPS special needs student, is also a well-known poet. State Sen. Morris Hood was furious as he spoke during the Senate debate. “You coward. You coward—to even take and put this legislation before us and before my community and not even have one Detroiter in the room to help negotiate this piece,” he said. 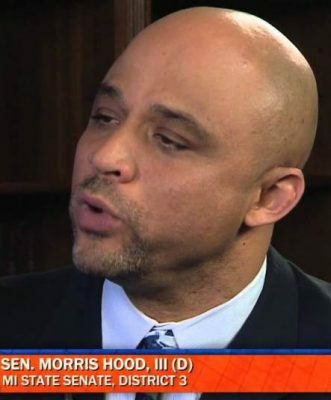 Michigan State Sen. Morris Hood III.